Rabbi Greene, what should we say? How do we respond? | ayekah -- where are you? Rabbi Greene, what should we say? How do we respond? I wish I had a simple answer for you. I believe that most people out there really have no sense of what the conflict is about or how it plays out. Most don’t realize that Israel has no presence — military or civilian — in Gaza. They don’t realize what Hamas is at its core. So, we need to respond. We need to give to the Stop the Sirens Campaign, we need to tell others to do the same, we need to write to our Senators and Representatives to encourage them to continue their support for the State of Israel, and we need to inform, teach, and share resources on social media. Here are a few pieces, some harder to access than others, to help arm ourselves in defending Israel as best as we can from Atlanta. One of the things that I think is very important is for us to also affirm: we believe in a two state solution, a Palestinian state side by side a Jewish State of Israel. I don’t mind saying that there are times when I wish Israel would make different decisions. But I share my critiques out of a love for Israel, not a desire to break it. So stand with Israel. Teach our friends and neighbors important truths. Pray for peace in Jerusalem and for the Palestinian people. No one wants bloodshed. But we need to listen to each other’s narratives and hope for one another’s success. However today, I need my community to read these resources and act. 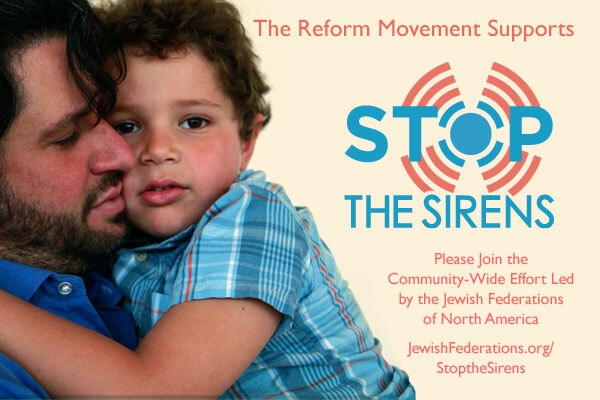 Support the Stop the Sirens Campaign with your act of tzedakah. This is the American Jewish community’s collective response to Israelis needs. Live Updates from a leading Israeli newspaper, Ha’aretz: click here. What if Terrorists Could Should this Rocket in Your Country? Then scroll down, and enter in YOUR CITY to see the range Hamas’ rockets can reach. Israel targets terrorists to protect its civilians. Hamas targets civilians while using its own people for cover. Since the beginning of Operation “Protective Edge” Hamas has been actively encouraging Palestinians in Gaza to become human shields by praising it as an act of bravery and proof of steadfastness, an esteemed Palestinian value. Hamas cynically exploits the Palestinian civilian population as human shields to protect its terrorist activity against Israel. Rocket launching pads and weapon caches are hidden in private homes and public buildings such as schools and mosques. Hamas exploits any collateral damage that results from its use of human shields for propaganda purposes. Hamas’ actions are in clear violation of the most fundamental principles of international law, including the principle of distinction which requires Hamas to clearly distinguish itself from its own civilian population. Hamas uses this horrific tactic knowing full well that, as opposed to Hamas, Israel takes every precaution to avoid harming uninvolved civilians. For example, Israel routinely warns residents about impending attacks to enable them to evacuate to safety despite the tactical difficulties this poses. A cartoon produced by Hamas calls on Palestinian civilians to form human shields against Israeli attacks. The cartoon depicts how a large group of civilians standing on the roofs of houses creates a metaphorical shield against incoming bombs, and praises the “steadfast people.” Cartoons are an important medium for influencing public opinion in Palestinian society.